New York - Cristiano Ronaldo has allegedly spent about $1.5 milion in a party during one of his recent trips to Morocco. Badr Hari shared a picture of him with CR7 on his Facebook page and wrote in the caption that they are having a great day. New York – Cristiano Ronaldo has allegedly spent about $1.5 milion in a party during one of his recent trips to Morocco. According to Portuguese magazine Flash, which provides details of the Real Madrid star’s recent trip to Morocco, many girls were flown from Portugal to take part in the parties in a resort in Agadir, in southern Morocco. In recent weeks, the all-time scorer of the Champions League has made several trip to Morocco where he appeared in many pictures with his friend, Moroccan kickboxing champion, Badr Hari. 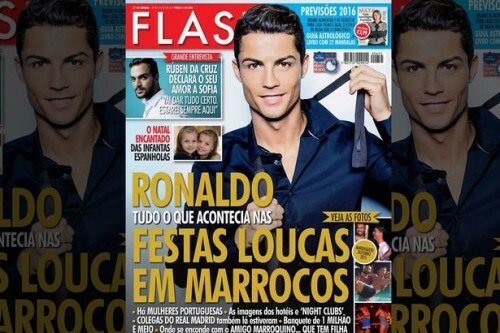 Moroccan media reported that Ronaldo traveled to Morocco twice in October. On both occasion, he met with his Moroccan friend. Pictures of Ronaldo and Hari were widely shared and commented on social media. The three-time Ballon d’Or winner, has reportedly spent over $150,000 in a dinner he offered to celebrate Moroccan former international Mustapha Hadji’s jubilee on October 28. However, in recent weeks, Spanish media reported that Ronaldo has been traveling to Morocco every day to reportedly se his Friend Hari. This has pushed Real Madrid to reportedly express its concern over the Portuguese star’s continuous trips. It is believed that Ronaldo uses every free afternoon he has to fly to Morocco aboard his private jet. Ronaldo’s trips to Morocco raised suspicions that he might be in “gay relationship” with Badr Hari. Last week, French reporter Daniel Riolo, claimed on television show ‘Touche pas a mon sport’ that two celebrities are more than just friends. The reporter made the unsubstantiated claim that Ronaldo goes to Morocco to receive “cuddles” from his Moroccan friend.